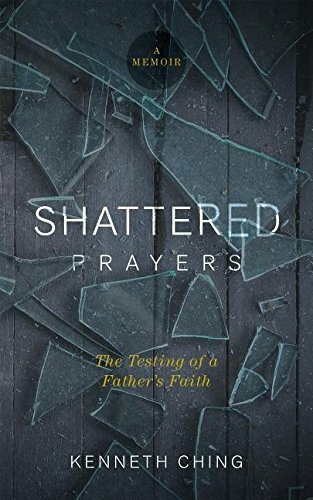 I can without reservation recommend that you read Kenny Ching's memoir, "Shattered Prayers: The Testing of a Father's Faith." Kenny and I were colleagues at Regent University's law school. We've each since moved on but I knew (and know) Kenny to be a fine lawyer, serious Christian, and an excellent writer. "Shattered Prayers" demonstrates the latter two of those virtues. Kenny's memoir focuses on two-plus years of his life as he and his wife Erin go from the thrill of her first pregnancy to the birth of special-needs son Joshua and beyond. What makes this 158-age book worth reading is Kenny's clear but understated description of the maddening world of modern medicine as even the best doctors turn out to be in the dark when confronted with an unusual case. Science was important but guesses--right and wrong--and luck as well as trial and error characterized the first two year's of Joshua's life and treatment. Without the dogged persistence of his parents, one can only wonder how Joshua would be today. That evening, my phone rings again. It's a local pastor. He asks about Joshua, and I give him a summary. He doesn't have much to say, but he ends the conversation by telling me, "Remember, God is sovereign." He's right. Of course God is sovereign. He's in control. He's got the whole world in his hands. He's got the little children in his hands, and from a distance, there is harmony and all that pabulum. I hope the pastor's son gets hit by a bus. Then he can talk to me about God's sovereignty. One of the lawyers at my firm calls. Her name is Ann, and she's senior partner. She tells me not to worry about work, to take as much time as I need, and that my family is in her prayers. Maybe this month I'll tithe to my law firm. Ann understood what my pastor didn't. My son is sick, and I need help and support, not homilies. A hammer thinks everything needs a nail; pastors think every situating needs a sermon. But Jesus knew better ("Weep with those who weep"), and so did Ann. What's wrong with Joshua, you wonder? A lot of things, and I won't take the time to list the results of the deletion of some of the genes on his 20th chromosome (a q20 deletion). Several things about Kenny's memoir left an impression on me. For all his doubts, there was no sense of self pity. Stuff--lots of stuff--happened and it left Kenny uncertain but not bitter. He continued to complain to God; he didn't give up his faith even in his anger. Second, I appreciated the memoir's matter-of-fact tone. Stuff happened incrementally and Kenny described it fairly; life continued one step at a time, from one uncertainty to another. Third, God's work in the background wasn't artificially brought to the foreground; "Shattered Prayers" is a memoir, not a theodicy. Kenny doesn't pretend any insights into the BIG picture. He clearly and simply recounts his perceptions, external and internal, of a difficult stretch of life. His Christian faith informs his journey; it doesn't explain it. In short, buy this book.